As a Microsoft TAP partner, ADERANT, a leading international ISV specializing in professional services management software, has been hands-on with Microsoft Visual Studio 2010 and Microsoft .NET Framework 4 for nearly 18 months. In this time we've built our embedded enterprise workflow product and services to take advantage of the new features, in particular Windows Workflow Foundation (WF) 4, Windows Communication Foundation (WCF) 4 and Windows Server AppFabric. 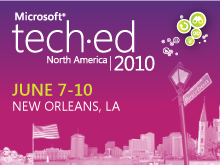 During this session we walk you through the changes we made, why we made them and how we are leveraging Visual Studio 2010, .NET Framework 4, and AppFabric to build software that runs in the world’s largest law firms. http://web.me.com/stefsewell/TechEd2010/.